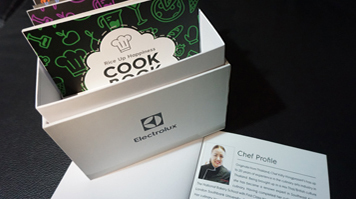 Kitty Vongprasert, a London South Bank University (LSBU) National Bakery School graduate and chef with over 20 years’ experience, has partnered with Electrolux South East Asia (SEA) to produce a series of recipes to mark the launch of their new prestigious rice cooker cook book. Electrolux is a global leader in home appliances, selling more than 60 million products to customers in more than 150 countries every year. Using her international background and experience, Kitty has created over 70 recipes, covering different menus from six countries in South East Asia. In just one month she has tried and tested different ingredients to create the dishes and then used food styling to take all her own photographs in the material. Kitty co-founded her catering service business Sugar & Spice 15 with a friend after graduating from LSBU’s National Bakery School. Utilising the services and expertise offered by LSBU’s Student Enterprise team she was able to test and scope her business idea whilst studying, going on to sell cupcakes and macarons with a fellow student at one of our Pop-Up Markets. She was also a finalist in the University’s Make It Happen Competition. Specialising in Thai and Indian foods, she has since used her passion for cooking to cater for large events. She is a regular contributor to Thai Smile Magazine UK and also works as an agency pastry chef at the 5 star Landmark London Hotel. “Through my course at LSBU, and with the help of the Student Enterprise team, I learnt how to conduct research, write research proposals and create business plans. I also learnt how to pitch and present myself with confidence. I can’t thank the Student Enterprise team enough for their help and support,” she said. LSBU was recently named Entrepreneurial University of the Year at the Times Higher Education Awards. Find out more about our enterprise community at LSBU.